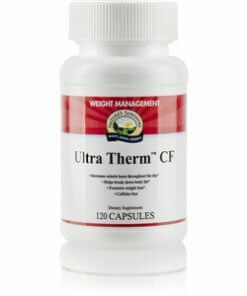 Nature’s Sunshine Ultra Therm CF combines rhodiola, green coffee bean, green tea, and hesperidin with a novel herbal blend for an intense calorie-burn that is caffeine-free. 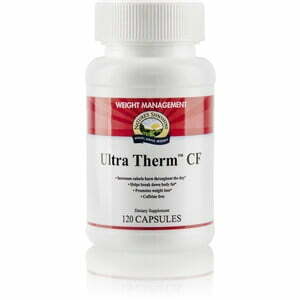 Boost your metabolism and start achieving your weight management goals with Ultra Therm CF today. Instructions: Consume 4 capsules each day, taking 2 in the morning and 2 at lunch. Each bottle contains a 30-day supply. This patent-pending combination of two herbs—Sphaeranthus indicusand Garcinia mangostana—may help promote weight loss, especially as fat, when combined with a weight-reduction diet, according to initial research. The extracts are thought to promote fat breakdown and weight loss. Specifically, they may affect levels of adiponectin in the body. Secreted mostly by white adipose tissue, adiponectin levels tend to be lower in individuals who are overweight. Native to high-altitude regions of Europe and Asia, Rhodiola roseahas well documented “adaptogen” properties. Adaptogenic herbs like rhodiola help safely counteract adverse physical, chemical or biological stressors. Study results indicate that rhodiola may improve physical performance and mental capacity, and it promotes a sense of well being. Our extract is standardized to 3% of the active ingredient rosavin, the amount used in clinical trials. Chlorogenic acid, thought to be the active ingredient in safe, caffeine-free green coffee bean extract (Coffea canephora), may help block sugar absorption, promoting satiety and healthy blood sugar levels already in the normal range. In initial studies, taking green coffee bean extract has resulted in weight loss, much of it fat, in overweight individuals. Drinking polyphenol-rich green tea (Camellia sinensis)has been linked to good health for centuries. Beyond already-documented benefits for cardiovascular health, brain health and healthy aging, the extract’s active components—including polyphenols such as epigallocatechin gallate (EGCG)—now show promise for weight loss. Researchers believe green tea may have a thermogenic (calorie- and fat-burning) effect and may inhibit fat absorption. Found in citrus fruit, this phenol promotes blood flow and a healthy inflammatory response by helping support healthy blood vessels.